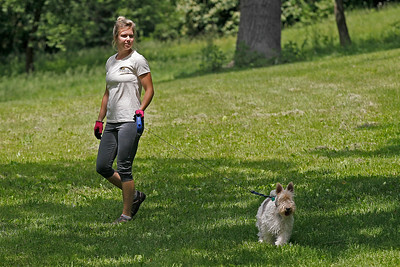 Matthew Apgar - mapgar@shawmedia.com Alden Kennels manager Laura Nelson takes Willy, a client's wire hair fox terrier, for a walk around the property on Thursday, June 4, 2015 in Ringwood. The kennel will remain open during this vacation season despite others closing down due to the H3N2 Asian dog flu that has been a concern in the Chicago area. Matthew Apgar - mapgar@shawmedia.com Alden Kennels owner Alden Domraise, left, and manager Laura Nelson keep an excited wire hair fox terrier named Willy calm as they put him on a leash for a walk around the property on Thursday, June 4, 2015 in Ringwood. The kennel will remain open during this vacation season despite others closing down due to the H3N2 Asian dog flu that has been a concern in the Chicago area. Matthew Apgar - mapgar@shawmedia.com Alden Kennels manager Laura Nelson leads Lucy, a client's basset hound, out of the kennels for a walk around the property on Thursday, June 4, 2015 in Ringwood. The kennel will remain open during this vacation season despite others closing down due to the H3N2 Asian dog flu that has been a concern in the Chicago area. 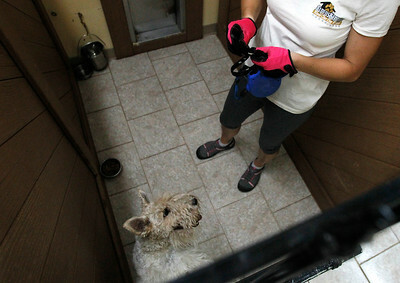 Matthew Apgar - mapgar@shawmedia.com Willy, a client's wire hair fox terrier, gets excited as he recognizes the leash held by Alden Kennels manager Laura Nelson on Thursday, June 4, 2015 in Ringwood. The kennel will remain open during this vacation season despite others closing down due to the H3N2 Asian dog flu that has been a concern in the Chicago area.